Prior to the completion of the Brigham City LDS Temple in 2012, the first sight which would greet a tourist’s eyes as they entered Brigham City was the impressive Mormon Tabernacle. This beautiful, historic building which towers above the trees and can be seen from the various entrances into the city was constructed by early day pioneers as a house of worship. In the early colonization of the Utah Territory, church members were encouraged to construct tabernacles as a gathering place and a house of worship. “a simple rock structure, the pulpit was at the east end, and the choir loft was behind the pulpit. The benches were hand-made, and some had backrests. This early building had no vestry, no balcony or gallery. By 1890 the building had been extensively renovated with a balcony on the north and south walls, which permitted seating of up to 1,200 with standing room for another 200. The pioneer settlers of Brigham had spent 25 years off and on in the construction of the tabernacle and sacrificed much of their time and means, hauled rock, quarried stone, and cut lumber from the nearby mountains. Much of the cash outlay of $5,000 was obtained from the sale of contributed produce, including Sunday egg collections. With the completion of the building and the grounds decorated with trees, grass and flowers, the tabernacle was dedicated by Church President Wilford Woodruff on October 26, 1890.”6Packer, pgs. 2-3. John Baird and Lars Mortensen went into the basement. Near the east heater, directly beneath the pulpit, they discovered the timbers on fire. They rushed upstairs, notified the dozen or so people who had already come to attend the regular Sunday services, and then dashed downtown to give the alarm. The people fled from the building, the men going into the basement to extinguish the flames. They soon found their efforts were powerless and at once returned in rescue of the silver service. When they reached the main room again, they found it full of smoke, that had burst up through the burning floor. They were unable to enter. In less than half an hour, the sacrament, snatched from the handsome silver service was being greedily devoured by the fire fiend. As soon as possible the firemen were on the spot. They were handicapped from lack of hose and shortage of water. But the fire had already got such a headway that work as they did, like young Trojans, they could not cope with the rapidly spreading flames. In less than an hour from when the fire was discovered, the main building was a mass of furious, cracking flames, and the fire had eaten its way through the roof and leaped upward into the inflammable tower. At 2:30 there was little left of the noble structure excepting the bare walls, now blackened, cracked and stripped of every square foot of wood; even plaster was completely skinned off. Excepting chairs, benches, etc., rescued from the vestry in the rear nothing was saved. A heavy south wind was flowing all during the conflagration. Burning cinders were carried a quarter of a mile into the northern part of the city. Several structures were then set on fire, but the flames were promptly extinguished. So Brigham City’s splendid Tabernacle is no more.8Quoted in Packer, pgs. 3-4. This tragic event did not thwart the spirit of the people. The Stake Presidency met with members of the First Presidency of the Church and approval was granted to restore the building. A competent committee examined the walls of the building and reported that it would cost $10,000 to reconstruct it. A sum of $2,500 was promised from general church funds. Contributions were solicited from the local church members and from persons who did not belong to the Church. The total cost of construction was $15,117.25.9Packer, pg. 4. 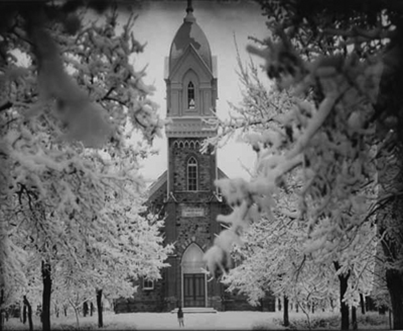 Just thirteen months following the devastating fire, the tabernacle was rededicated on March 21, 1897, by President George Q. Cannon. 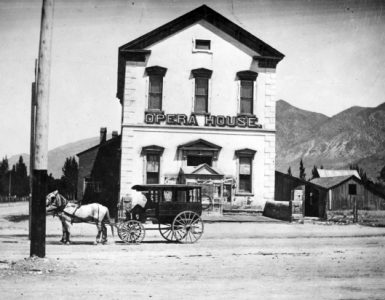 A writer in the March 20, 1897, edition of the Brigham City Bugler explained, “What on the day of the great fire appeared a calamity, will tomorrow be looked upon as a great blessing — there is really no comparison between the old and the new.”10Packer, pg. 5. A steeple tower adorns the west end of the structure, and 16 pinnacles cap the red brick buttresses, which support the rock and limestone walls. The pioneer architects selected a Gothic exterior and tall slender windows and doors set off by the Gothic arch. The vestry is on the east end of the building, and the balcony provides seating on the north and south sides. The pulpit, now on the west end, is surrounded by choir seating. The floor was reconstructed so that it slopes from the rear by the vestry to the front. The pulpit is elevated at both the high council and presidency levels. Electric lights were added to the building. A majestic Reuter organ was installed in 1951 which is enhanced by the superb acoustical properties of the pioneer tabernacle which houses it.11Packer, pgs. 5-6. The Church of Jesus Christ of Latter-day Saints completed a major restoration of the Tabernacle in 1987 at a cost exceeding $700,000. The exterior stonework was cleaned and repainted. The brick on the buttresses was stripped of the dark red paint. Worn bricks were replaced and the pinnacles completely rebuilt. The exterior wood was repainted and the roof was repaired and re-shingled. New exterior doors were installed, keeping with the Gothic design. The interior was completely repainted with special attention given to the woodwork, plaster ceiling cornice and chandeliers. The heating system was reworked for better efficiency and new electrical and plumbing systems installed. New carpet was designed and installed, the organ was cleaned, re-voiced, and the case embellished to match the Gothic and classical decor.12Packer, pgs. 6-7. The restored Box Elder Tabernacle was dedicated by Elder Boyd K. Packer of the Quorum of the Twelve Apostles on April 12, 1987. 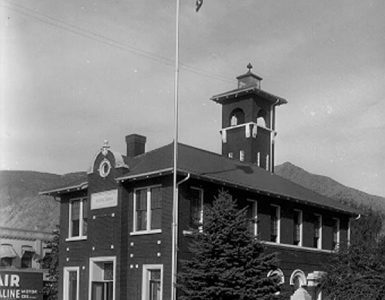 It has served the Brigham City area for more than 100 years. From its pulpit, most presidents of the Church of Jesus Christ of Latter-day Saints have spoken sermons. It continues to be used in the community for stake conferences, other church meetings, and appropriate musical presentations. Free guided tours are given from May through October of each year.13Packer, pg. 7. The architect was Truman O. Angell.